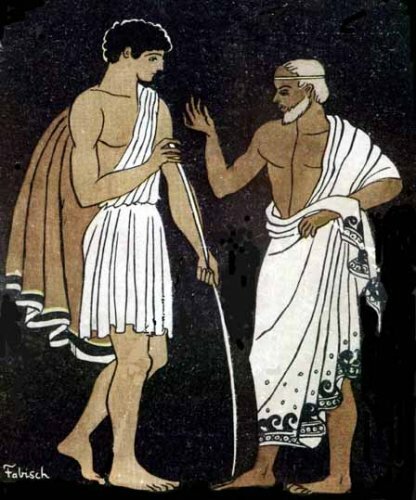 The story of Telemachus takes place within the broader context of the Odyssey, in which Odysseus experiences a series of initiations (all of them, curiously, by female figures) and evolves from a one-dimensional, heroic figure into a mature, archetypal king. Early on, the gods made repeated comparisons between Telemachus and his cousin Orestes. Neither had seen his father since infancy. Telemachus knew of Odysseus only through the memory of the citizens, and through the longing of his mother Penelope. His lack of fathering was evident in his inability to confront the crowd of suitors who were eating up his possessions and threatening his inheritance. He was an ephebe with no elders – most had never returned from Troy – to oversee his initiation. His mother, for all her love, couldn’t provide it. Without it he couldn’t become king; indeed, he would certainly be killed. Athena, disguised as a family friend – Mentor – intervened, advising Telemachus to undergo a dangerous night-sea journey to Sparta, where he met the fabled Helen and Menelaos, who had returned safely from Troy. whose nestlings farmers take before they fly. Fate looked favorably upon the House of Ithaca. 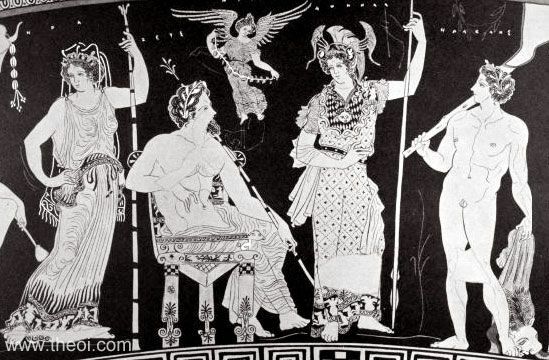 Telemachus’ initiation, overseen by a female deity, was relatively painless (if we ignore the frightful implications of the night-sea journey), partially because he had a loving mother who was capable of letting him go to find his father. Actually, he left without asking Penelope’s permission. But we may consider Penelope as an aspect of Athena, who suggests that he go, just as Helen is an aspect of Aphrodite. He defended the good mother. He died as boy into man without having to symbolically kill her, and his transformation paralleled that of his father. Authentic masculinity serves the feminine. Heracles is extremely complicated, with more – and more conflicting – stories than any other figure in Greek myth. Born of Zeus (who remained absent from his life) and a human mother (Alcmene), along with a twin (Iphicles), his name meant “Glory of Hera.” Yet Hera sent snakes to kill him in the cradle, persecuted him continually and drove him mad so that he killed his own children. As penance for that crime, he was forced to labor for twelve years. Yet Hera had been tricked into suckling him (her milk made him immortal), and their relationship was ambivalent. In a real sense, she was his mother. Once, he actually rescued her from danger. Heracles was the ultimate compulsive, misogynistic and violent strong man, a culture hero (“hero” is derived from the same root as Hera), yet in two episodes he was a transvestite. He rid the world of monsters and obtained the inexhaustible horn of plenty, the cornucopia; yet he usually needed Athena’s help. Like Odysseus and Dionysus, he traveled to the underworld as part of one of his labors. But the consistent theme in most of his tales is his laboring and his suffering; and his labors – and glory – were for Hera. We are so used to assuming that the son of the great mother appears as a beautiful ineffectual who has laid his testicles on her alter and nourishes her with his blood, and we are so used to believing that the hero pattern leads away from her, that we have lost sight of the role of the Great Goddess in what is closest to us: our ego-formation. Hera had made him suffer continually; yet it was she who ultimately honored him. Why had she been so hard on him? Perhaps we should ask: would he have achieved so much if she hadn’t persecuted him? Whether in human terms it had been worth it or not, he was finally rewarded for having served the mother of material civilization.